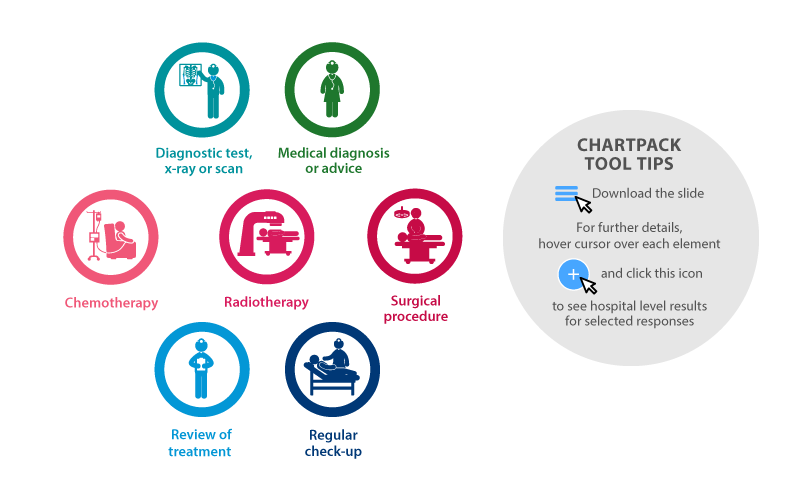 Chartpack: How do outpatient cancer clinics perform? The Outpatient Cancer Clinics Survey reflects the experiences of care and self-reported outcomes of more than 12,000 patients who visited an outpatient cancer clinic in one of 51 NSW hospitals during November 2016. The full survey results are available on BHI’s interactive data portal, Healthcare Observer. The Outpatient Cancer Clinics Survey asked for feedback from patients who visited an outpatient cancer clinic in one of 51 NSW hospitals during November 2016. The survey comprised 78 questions, covering different aspects of care and patient characteristics. Of these questions, 47 relate to specific measures of clinical performance. BHI sent 21,474 questionnaires to randomly selected patients from the 31,006 eligible patients after their outpatient cancer clinics visit.  There were 12,024 patients who answered the survey, representing a response rate of 56%. Patients attend outpatient cancer clinics for a range of diagnostic, therapeutic and consultation services, including some patients (11% of respondents to this survey) treated for conditions other than cancer, such as rheumatoid arthritis and lupus. 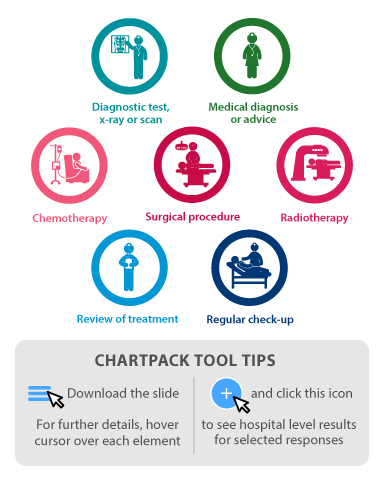 Therefore, the results in this chartpack reflect the experiences of patients receiving treatment for cancer and those being treated for other conditions. The type of cancer reported by the 87% of survey respondents who said they had cancer is shown at the bottom of this page. Patient case mix (including cancer type) has not been taken into account when comparing hospital results with NSW results. Across NSW, 51 hospitals with outpatient cancer clinics were included in the survey – 48 public hospitals and three private facilities: Chris O’Brien Lifehouse, Sydney Adventist Hospital and the Riverina Cancer Care Centre. Together, these three facilities provide cancer services to a large number of patients within certain LHDs. Two of the private facilities, Riverina Cancer Care Centre and Sydney Adventist Hospital, were included in the survey for the first time, as a pilot project, in November 2016. The responses from patients who attended these two facilities are included in the overall results for NSW, but are not reported at the individual facility level. The third private facility, Chris O’Brien Lifehouse, was included in the survey for the second year and as such its facility-level results are published in the chartpack and its supporting materials. This facility is a not-for-profit integrated cancer treatment centre, contracted to provide services for some public patients. It is not managed by Sydney Local Health District, despite being located within that LHD’s boundaries. Therefore, caution is advised when comparing results from Chris O’Brien Lifehouse with public hospitals. The survey sampled all outpatients attending cancer clinics, regardless of funding sources. Therefore, out-of-pocket costs may vary across facilities depending on their mix of patients’ funding sources (e.g. bulk-billed and fee-for-service). Patients may also have included expenses for medical services, such as those co-located in the same hospital or campus, which were not provided by the outpatient clinic they attended. Although the Outpatients Cancer Clinics Survey was first run in 2015, substantial changes were subsequently made to the questionnaire and sampling methods – therefore comparisons between 2015 and 2016 results are not reported. Detailed information on analytic methods is included in the Technical Supplement.